Robbo aiming for third time lucky! Wigan Athletic new-boy Gary Roberts admits he’s hoping to make it third time lucky in terms of winning promotion alongside Paul Cook. Roberts was one of a dozen new-boys to arrive at the DW Stadium during the transfer window, having left Portsmouth earlier this summer. After winning promotion under Cook with both Pompey and previous club Chesterfield, Roberts needed little persuasion to put pen to paper when Cook came calling last week. And he sees no reason why the winning formula can’t continue with Latics hoping for an immediate return to the Championship. “I gave gave myself a fortnight to decide where I wanted to play, whether I wanted to travel or be at home,” Liverpudlian Roberts told the Wigan Post. “You weigh up all your options and, at the end of the day, you stick with what you know. 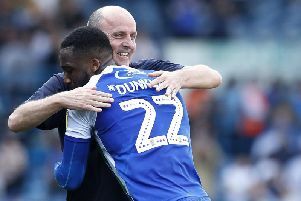 “In the last four years with him I’ve had two promotions and two play-off finishes across two clubs. “And once he showed a bit of interest there was only one place I wanted to go. “I could have gone to another club, but I know what I’m getting with the gaffer.